Derbyshire's new elite performance director Graeme Welch is urging his promising young bowlers to make a first-team impact this summer. The club begin their bid for a swift return to County Championship Division One at Leicestershire on Sunday. "Greg Cork [son of England's Dominic, 19] has a lot of ability and Ben Cotton  has come straight out of the academy," Welch told BBC Radio Derby. "They're raw, but there'll be injuries and I'm sure they will be called upon." Son of former England and Derbyshire man Dominic. Left-arm seam bowler, right-hand batsman. Born in Derby, aged 19. Derbyshire will be captained by Wayne Madsen, who rebuffed interest from other teams to sign a new three-year deal in November, despite the club's relegation. He won the Cricket Writers' Club County Championship player prize after scoring 1,221 four-day runs last year and will be expected to contribute a big haul again. 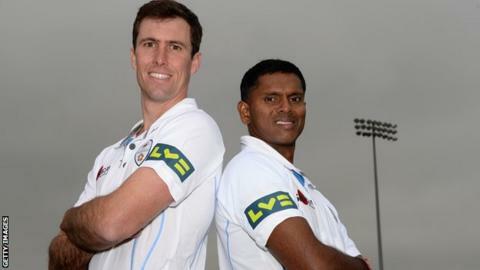 Runs are also expected from Derbyshire's two overseas players, with former Australia batsman Marcus North to slot in when Shivnarine Chanderpaul is on international duty with the West Indies. Further strength to the batting line-up has been added through Stephen Moore and Scott Elstone following their respective releases from Lancashire and Nottinghamshire. But Welch insists it is the performance of the squad as a whole, not any individual that will determine the club's fate in 2014. He said: "I was surprised at the talent we had when I went in the nets, which really stood out. We have some very decent players. Played through Staffordshire age groups from under-13. Right-arm seam bowler, right-hand batsman. Born in Stoke, aged 20. Educated at Clayton Hall Business and Language College and Stoke Sixth Form College. "We have told the lads that it's not a first and second team - it's a squad. We expect the lads who aren't playing, whether playing in the second team or club cricket, to dominate, so if and when called upon they are ready." "It's quite a strong Division Two with Hampshire, Essex and Surrey, so we are going to have to play some good cricket, but we have prepared right over the past three months." Last season was also disappointing for Derbyshire in the one-day formats as they finished sixth and fifth respectively in their groups of the 40-over and T20 competitions. Welch is optimistic better form is on the horizon following an encouraging pre-season trip to the United Arab Emirates. "We had some meetings out in Abu Dhabi, brainstormed some things and put a lot of plans together," he said. "We played against Worcester over there and played really well and against New Zealand, where we took them by surprise for the first 10 or 15 overs when we bowled. "We took a lot of confidence out of that and the experience of playing against big teams and I think that will stand us in good stead."